Having had a great time in 2013 we decided to return to Grenada to Mor Gan villa for our 2014 holiday. Knowing what the site is like and even what might work or definitely doesnt, means that the second time around visit can be more tightly planned. Although the KPA amp and the K3 were a great combination I had been concerned about taking the K3 with me again because it is my main station radio, is rather valuable and I had had trouble with it in J3, trouble which required me to do quite a bit of disassembly which I wouldn’t have been able to do on a DX trip. In any case a completely portable BERU Open section station is just not going to cut it against the big gun home stations. So the Restricted section is the one to go for, 100w and single element antennas. A number of us DX travellers have come to the same conclusion. I had an old K2 QRP in the cupboard to which I added the 100w amp and an ATU and with the Microham keyer this makes a very robust set up, CW only but plenty of fun. And a solid bit of kit which can easily be hand carried and will survive the inevitable knocks of travel. 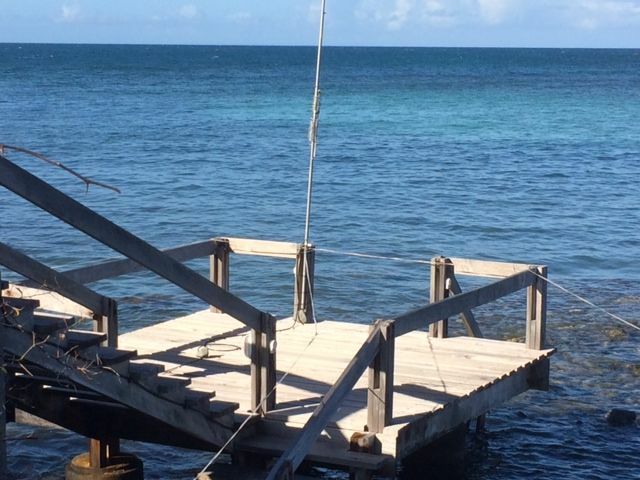 In 2013 I had used two antennas, a vertical doublet for HF mounted on the villa and an inv L/GP for 80/40 with elevated radials mounted part way down the villa jetty over the sea. After a lot of playing around in the garden at home I began to wonder if this was the right approach. Although the doublet is simple it does require a tuner to cover all bands. I played around with parallel dipoles but after much cutting and legthening I really couldn’t say I had an antenna which would be ‘set and forget’, rather more likely I would end up frustrated with a pile of shorter and shorter bits of wire. Somewhat as a last resort I dug out and cleaned up my old Butternut HF6V and in about an hour I had it working on all bands except 17 and 12. A home brew second stub allowed 12m operation but I gave up on sorting out 17m. Now I find the Butternut a bit of a compromise, its too short on 80 and too long on 10m, still it does seem to work as it says on the box. The plan was to mount it at the very end of the jetty with its base in the sea. However a bit of thought showed this to be a non starter as the tidal range in Grenada is about a metre and so the length of the ground lead would be changing by that amount twice a day. So I had to revert to the elevated radial approach as that should be a more stable arrangement. I used 4 of the Butternut multiband radials and a pair of 22m radials for 80m. This all tuned up just fine. I also found that the tubing of the Butternet all nests and is only 1 yard long rather than 1 metre of a fishing pole and this made the package shorter and less obvious. 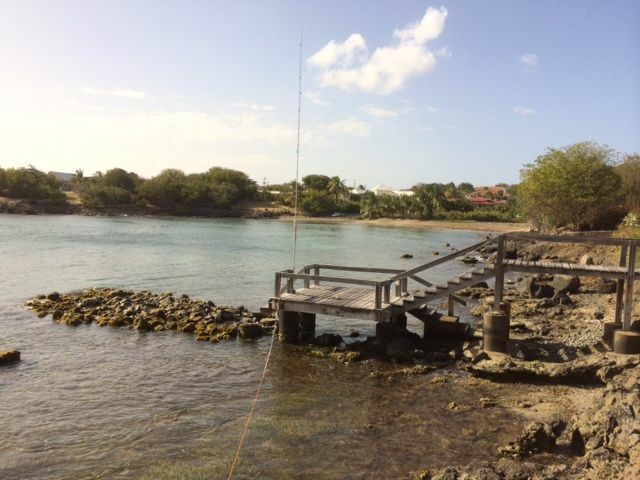 I had left my fishing pole in Grenada with Derek J35X and I was able to borrow it back to put up the vertical doublet as well in the same place as I had in 2013. This provided a most useful comparison with the Butternut. As I said I put the Butternut at the very end of the Jetty – I suppose 10m from the shoreline with its elevated radials about 1-1.5 m over the sea, see pictures. Now I could switch between the doublet and the Butternut. On every band 20-15-12-10 the Butternut outperformed the doublet and on 12 and 10 by quite a big margin. And this advantage applied to all signals not just those from the more southerly seaward directions. Modelling antennas over sea and land grounds says that this should be the case but its nice to see it in action. But I dont understand the 10m results. I am still convinced that a shorter 10m antenna should have less end fire than the Butternut 3/4 wave but hey, time was running out. Fortified by this experiment I changed the the vertical doublet to a horizontal one, now the Butternut still had the edge but less so on 20. However the big finding was that of background noise. The Butternut was very much quieter than the doublets as it was a lot further away from the overhead power lines. At this point I was tempted to think what might have been in 2013 if I had made some diferent choices. I then realised that the setup I was going to use in 2014 was identical to the one I took to E5 South Cooks in 2007! I had gone full circle k2>k3>K3 and KPA > K2! The usual bit of pile up operating on 12 and 30 showed that I could definitely make a noise around the globe. But then the 30m capacitor terminal fell off when doing the last checks on friday. So I didn’t mess with it just took the whole 30m assembly off and retuned – in fact it improved the match on both 40 and 20. .The start in the Caribbean is at 0600 local, jet lag almost guaratees you will be awake in time. A quick 1/2 to an hour working VEs and other Carib stations, better just to get them in the log – and yes I know they will be around later. But some might be 12 hour stations or they might have antenna problems… Then moving up as the bands open. Not much to say really except that there was a lot of mixed LP and SP propagation with resultant echo. Very pronounced on the strongest UK signals but not on weaker others. Plenty of CQing and very systematic searching of the bands for bonuses and new stations. In normal life suppose it might be a surprise for a G to be called by a J3, not in BERU. But the real surprise came later in the day when the trans Pacific path opened. I have never heard such strong VKs and ZLs and on bands with such low background noise, quite extraordinary. At about 2300 I thought a trip to 40 might be a good idea. This produced a rather large pile up and I hope I managed to work every one who qualified for a report. Nuisance callers are a real problem on 40 and one F8 was a real pest but he got the message in the end and did a bit of DQRMing before he went off to have a brandy to calm his nerves, poor soul. If you are a ‘DX’ in BERU you must not work them else they all pile in and you lose control. I did work a few when it was quiet but didnt bother to log them. I find a small QSY generally fools them but not the BERU types who seem to catch on pretty quickly. The impact of RBN/cluster is now very apparent with little runs starting from nowhere from time to time and immediate pile ups on band changes. And then there is the small matter of that QRP station on 80. He was really weak and getting my serial involved collecting 4 single numbers 0,1,6,9 and then working out that the first must be a 1 because he had given me a serial over 100 earlier. And the last was a 9 after about 10 repeats so the middle must be 0 or 6 but it had dots in so must be a 6! Still it was a 5 bander Roger! After the UK>VK/ZL LP opening at about 07-08 hrs which is 03 hrs local in the carib things really slowed down and I didnt work much in the last few hours and called it a day at 0530 local. I am always ready to QSY on request but this year I seemed slow on the uptake myself. Here is what I claimed. Interestingly I made almost the same number of Qs on 80 as 2013 but made only 20 bonuses rather than 31. Over all I made more Qs 845/817 and more bonuses 217/149 ( according to Win Test). All that with less power but without the time loss I suffered in 2013 – makes you think how this all depends on propagation and as ever location, location, location.I recorded the whole 24 hours. Just as well when I sent the same serial twice and will have to check what actually went out. Log will be on LOTW, just e mail for a bureau card if anyone wants one. Many thanks to Derek J35X for sorting out Sean Francis at NTRC for the licence renewal. And for making up our Team Carib to 4. The villa owner, Mrs Pat Hughes, with Venitia coudnt have been more helpful. Radio friendly villa found and it has a nice pool too to cool off in. Travel and villa booking was organised through Just Grenada.